Lerner Research Institute recently announced the formation of a new core service called the Human Biorepository Core (LRI-BioR), which will increase the translational power of research at Cleveland Clinic. The LRI-BioR will collect and provide samples from healthy controls and patients to enable investigators to uncover the mechanisms of disease. Samples will be tailored to specific projects and carefully characterized and prepared for research, helping to advance and accelerate disease-specific, precision-based research at Cleveland Clinic. This new core service will help researchers navigate the entire process of requesting and acquiring biological samples—from understanding feasibility of using human samples to ensuring adherence to compliance and regulatory processes. The LRI-BioR will help reduce common barriers to entry for early-stage researchers or those who do not have experience in clinical and translational research. Suzy Comhair, PhD, Staff Scientist, Department of Inflammation and Immunity, will serve as director of the LRI-BioR. 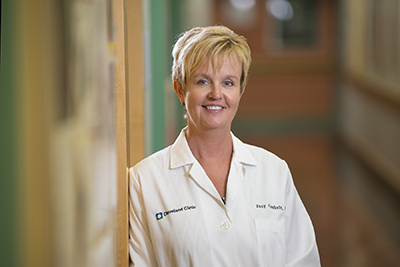 She has extensive experience facilitating and fulfilling human sample requests for researchers at Cleveland Clinic and across the United States. She directs biospecimen and biorepository resources for city-wide program projects funded by the National Heart, Lung, and Blood Institute (part of the National Institutes of Health, NIH), as well as for national network clinical trials funded by NIH. Her own research program in heart and lung diseases spans fundamental, translational and clinical research, providing broad experience to lead the new core. Dr. Comhair will work closely with the Clinical Research Unit of the Cleveland Clinical and Translational Science Collaborative and the Pathology & Laboratory Medicine Institute (Jennifer Ko, MD, PhD, and Bradley Skilton) to acquire human samples. Additionally, the activities of this new core will intersect with those of the recently announced Cleveland Clinic Biorepository. To learn more about the services provided by the LRI-BioR or to request samples, contact Dr. Comhair at LRI_BioR@ccf.org.